I began my Reishi experiment one lovely Saturday afternoon by going to my local farmer’s market. I had seen the famous shroom there in the past, but had no idea what to do with it. So I admired it from afar— until today. 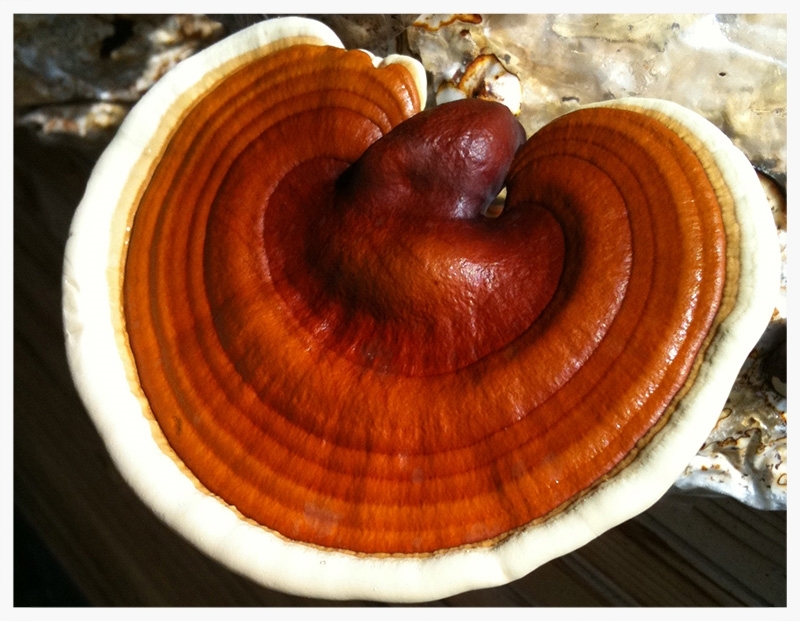 With some quick web research on DIY Reishi tea, I was able to buy my first fresh Reishi mushroom with confidence. I admit to staring at it on the kitchen counter for a long while; it looked prehistoric, massive, shiny, rubbery and excitingly alien. I began cutting it into thin slices, quite instinctively. I knew it needed to dry it in order to make some tea or other interesting concoction. It took about a week to air dry before I was satisfied that it was completely dry and could be powdered successfully. The coffee grinder ground it down very finely— a word of warning though, the second attempt did break my grinder. You can also boil larger chunks of the mushroom and make a decoction. All methods of processing always points to using heat to access Reishi’s healing properties, whether it’s boiling water while cooking it or making tea. I decided to drink it on an empty stomach in the mornings to really feel its effect. I placed the powder in an empty tea bag— the taste of the Reishi is too earthy for my palette so I added some peppermint tea for flavor. I decided to stop drinking coffee also, and proceeded with the Reishi detox every morning for the next month. I loved the even keeled temperament that lived in my body, I would even call it a state of Zen. I want to preface this next passage by expressing my great disappointment on running out of Reishi at the end of the month. I would look forward to it every morning, but I also needed to stop to see how long the effects stayed with me. When I first began drinking the tea, I felt a change pretty much right away, as I was giving up coffee at the same time, I expected some withdrawal effects from the caffeine but they didn’t appear. My detox sailed smoothly into a state of serenity and calmness. These remarkable qualities increasingly became part of my own personality as well. I felt it even more after a few weeks. When dealing with everyday matters I could tell that a shift had occurred, I had the incredible ability to recognize when issues were insignificant in the bigger picture. I was not getting mad or over-reactive with people or situations, in fact, it made me realize how unbalanced I’d been before the tea. My previous state of mind had been a little agitated and I would get irritated more than I wanted too. With Reishi, my brain became clearer, quieter, and I was able to remember things from way back in my past, as if the doors of my unconscious mind were opening one by one. It wasn’t overwhelming, I was just able to observe. I felt alert and also sensitive to people and situations. I did have one day that a New Yorker screamed at me— that upset me a lot. I realize that a contemplative state of mind could have its drawbacks but, I loved the even keeled temperament that lived in my body, I would even call it a state of Zen. Reishi seemed to heal and balance each of my chakras, soothing my nervous system and in turn allowing my creativity to soar. I felt my metabolism balance, my cravings diminish, and because my diet improved as well I gained more energy and stamina. This balancing effect stayed with me for about a month after I stopped drinking the tea. After another month, however, I began to feel some impatience creeping back into my life so without hesitation I immediately went out and bought another shroom. I would love to forage for Reishi but buying it fresh at the market is as good as it gets for this New Yorker. My Reishi journey has been fun and rewarding. The cramps in my hands went away and I can honestly say that this magic, medicinal mushroom has transformed my physical and and mental state in a truly blissful way.